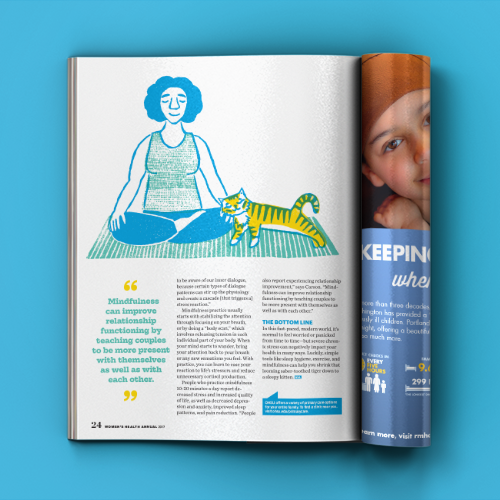 Art-directing and designing OHSU's 2017 Women's Health Annual put many responsibilities on my shoulders—one of which was researching and choosing an illustrator to work with for the feature. Michelle Leigh's style was exactly what we were looking for! The feature is written about how to handle stress—much like taming a tiger. I ran with this concept, and chose to show the tiger (portrayed as stress) becoming more cub-like as the main character took steps to alleviate stress—like eating well, exercising, and practicing meditation. Other responsibilities included photo research, creating photo illustrations, and page layout.